Santa Trinita Madonna, was painted by Cimabue for the main altar of the Church of Santa Trinita in Firenze between 1280 and 1290. The definition of this Madonna is Maestà, which means Majesty, the Virgin Mary sitting on a throne with Jesus on her lap. This is one of the three Maestà visible in this room, the other two being the one by Duccio di Buoninsegna and the one by Giotto. The comparison of these three altarpieces soon reveals how the art of painting changed in the space of less than 20 years. 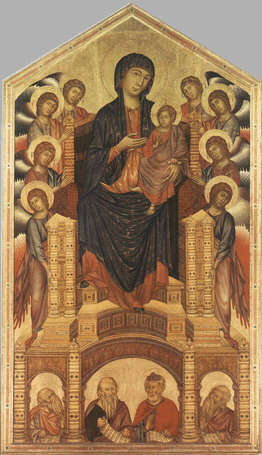 Cimabue’s Madonna still shows the main traits of the Byzantine style: a profusion of gold and an almost total absence of volume and perspective. How precious, elaborated and refined is the throne where the Virgin Mary is delicately sitting!